I had read the title line a long back but I could not analyze the correct stand point behind this line. But now after my retirement, I try to evaluate the meaning of every word to put wiser myself and also my fellow readers. 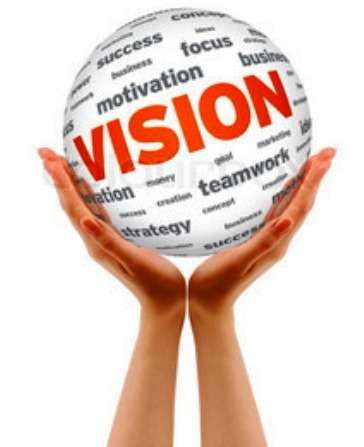 A clear vision brings focus and provides an anchor point for making bold and strategic choices. How it comes for the visually impaired person, when I put a title to my documentary on them with title ‘Vision without Eyes’. Really, it was symbolic and got a good response from one and all after seeing it on presentation in the form of CD to every visitor in the Home for the Blind. Its circulation increased the number of visitors and thus giving a helping hand to the institution and reducing the overall budget to take care of this class more comfortable. When a vision is a compass that definitely ensures a team work, it also inspire, engage and activate people so that they are able to do a better job. It also gives you an opportunity to have choices about your dreams and ideas it also needs a perfect opinion, attitude and a stand point as well without which one cannot fulfill his vision. I recollect that when I wrote to Khuswant Singh in 1992 to send me a message for my book - Akhon Prokhe – Out of Sight – dedicated to the blinds community, at the first instance I was surprised to receive a post card – which normally use to reply to everyone even with one line reply as - I don’t send messages they are pompous and pointless. I however, wish your journal a success but when I got it printed on the back cover along with other message, everyone appreciated him and acknowledge my daring to print ‘as it is’ which too got a good response from the readers and well-wisher for the visually impaired persons. Not only this, Imroz - which started living with Amrita Pritam despite married to Pritam Singh to whom she had betrothed when she was a child but said to have unrequited affection for poet Sahir Ludhianvi but started living with the artist and poet Imroz as her long-standing partner – did not charge any amount for the title my book, with a word personally to me – since the purpose for which the book is dedicated has moved me to design the cover page and it is the first title designed for a book other than Amrita Pritam. Today, I realize that not only the vision but the position and approach for the cause also matters.